Many will agree that wisdom teeth removal is one of the most nerve-inducing procedures there is! While it can often be imperative that you have your wisdom teeth taken out, especially if they’re causing pain or other forms of discomfort, it can be a major source of stress and anxiety for individuals, no matter what age they are. With these helpful tips, you can overcome your wisdom tooth jitters and feel more at ease in the days leading up to the procedure. Best of all, you can also gain a greater sense of knowledge about what it entails and gain greater confidence overall. First of all, what are your wisdom teeth, anyway? Known as the third molars, wisdom teeth develop later in life and typically appear between the ages of 17 and 25. While some people aren’t bothered by their wisdom teeth, others can actually feel a strong sense of discomfort as a result of them breaking through the gum line. If you’ve visited a dentist office in search of help with your wisdom teeth, chances are you’ve heard the phrase ‘impacted’ tossed around the room. This refers to the process by which teeth – unable to fully move into place in the mouth – peak through the gums yet do not move all the way up. According to the American Association of Oral and Maxillofacial Surgeons, nine out of 10 people are affected by impacted teeth, which if left untreated can be susceptible to infections and could damage teeth surrounding the site. Another scary phenomenon that can sometimes occur when impacted teeth have not been treated or removed is the developed of fluid-filled cysts, which can expand at the root of one’s tooth. If this is allowed to worsen, it can damage the jaw and nerves surrounding the tooth. Despite that many people undergo wisdom tooth extraction, they can remain unclear about why this form of dental surgery is truly necessary. 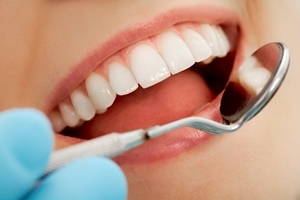 The AAOMS estimates that 85 percent of wisdom teeth will eventually need to be removed. But why do we have them in the first place? While some people don’t have any wisdom teeth at all, the varying number in teeth that people have in general could be linked to evolutionary changes, according to Scienceline. Most people only have four wisdom teeth. However, in a study published in the Journal of the Canadian Dental Association, researchers reported that some individuals can have more than four teeth, although the reasons behind the development of these superfluous teeth remains unclear to researchers. While many dental procedures can be done in a way that is painless, dentists that are doing a tooth extraction may have a more difficult time reducing the amount of discomfort that individuals feel. The fear of being uncomfortable during a wisdom tooth extraction is one of the biggest concerns among individuals preparing for the procedure, yet by speaking with one of our Dalton dentists, you can gain a greater sense of what it entails. You may need to get your wisdom teeth removed if you’re experiencing aches around the site of the tooth, or if you’re noticing that other teeth in your mouth are shifting positions in order to accommodate the emerging tooth. This can throw your jaw’s alignment into whack and have a poor impact on your ability to chew and do other things with your mouth. Well, you’re finally here – the day of your big wisdom tooth extraction! Chances are, you’re feeling nervous about the prospect of the surgery. If your nerves are really giving you a hard time, you may want to consider asking your family dentist where it’s possible to be put under sedation. Getting knocked out for the duration of the surgery can alleviate some of the nervous tension you may be experiencing in the moments leading up to the extrication, and could even give your surgeon the opportunity to get the procedure done at a faster rate. If you’re only having one tooth pulled, you may be a better candidate for local anesthesia, but this is all contingent on your dentist’s recommendations. Before administering the local, your healthcare provider will likely apply something to your gums that will numb sensation in the area. During this work, a dentist will do his or her best remove the teeth in a way that minimizes the level of pain you’ll feel during recovery. According to the Mayo Clinic, he or she will do several things, including removing the teeth through incisions made in the gums and stitching the wound up if absolutely necessary – this can facilitate the healing process. Contact your local dentist for more information on wisdom teeth removal.